If you go to Wikipedia's page for American Novelists, you might notice something strange: Of the first 100 authors listed, only a small handful of them are women. You could potentially blame this on the fact that there simply are more famous male authors than there are female (a-whole-nother can of worms), but the real reasoning is much more intentional. Wikipedia editors have slowly been moving female authors to a subcategory called American Women Novelists so that the original list isn't at risk of "becoming too large." Bad luck, ladies. They need to make room and someone has to go first. 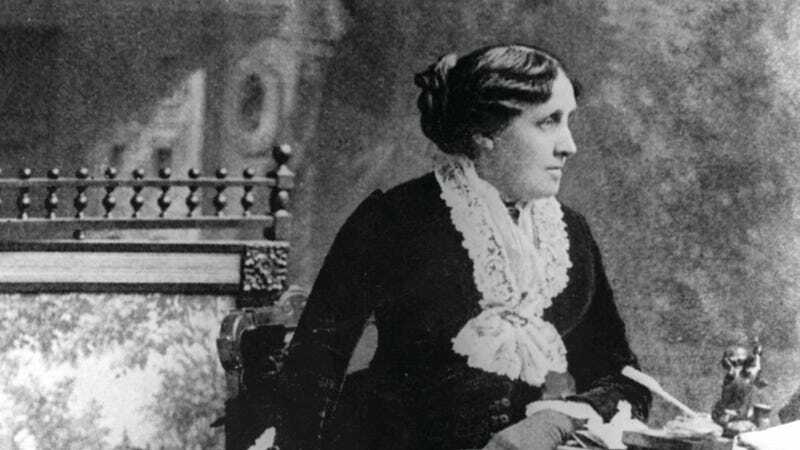 Why shouldn't it be unimportant literary folk like Harper Lee, Harriet Beecher Stowe or Louisa May Alcott? Novelist Amanda Filipacchi was the one who — very recently — first cottoned on to what Wikipedia was doing. The edits, she noticed, have been happening gradually and mostly alphabetically by last name though in a few special cases the editors jumped ahead because they just couldn't wait for R and T to get Ayn Rand and Donna Tartt off the list. Filipacchi herself was one of the authors to get booted to the subcategory. Please note that there is no subcategory for American Men Novelists. It appears that many female novelists, like Harper Lee, Anne Rice, Amy Tan, Donna Tartt and some 300 others, have been relegated to the ranks of “American Women Novelists” only, and no longer appear in the category “American Novelists.” If you look back in the “history” of these women’s pages, you can see that they used to appear in the category “American Novelists,” but that they were recently bumped down. Male novelists on Wikipedia, however — no matter how small or obscure they are — all get to be in the category “American Novelists.” It seems as though no one noticed. According to Abigail Grace Murdy of the Melville House blog, only 9% of Wikipedia's editors are female and women make up on 19% of the site's contributors. If your reaction is "It's only Wikipedia and at least the women are still on there somewhere," consider that plenty of people do use Wikipedia as their primary resource for information and that, by being left off the American Novelist list, many of these female authors will be entirely ignored, probably not for the first time in their histories. Exactly. The sad fact remains that women don't need anymore handicaps in the publishing world where male authors still get taken more seriously than female ones. This is the reason that Joanne Rowling became J.K. Rowling. This is the reason that the boys I took creative writing with back in college loved that "A.M. Homes dude," but had little-to-nothing to contribute when talking about Zora Neale Hurston, Mary Gaitskill and Mona Simpson. And it's not an issue of the themes people are attracted to. There are plenty of female writers who write in ways that are thought of as typically masculine (take the aforementioned Homes or Flannery O'Connor for example) just as there are plenty of male writers who write in ways that are considered more feminine. (Remember the great Weiner-Eugenides debate of 2012?) Maybe that's because the reader's own limited view forces them to see novels as bro-ish or girly when really it's more a difference between being optimistic or sad, sentimental or stoic — all having nothing to do with the gender of the writer. What it all boils down to, once again, is sexism. By allowing male authors to simply be "American Novelists" and forcing female authors to be qualified as "American Women Novelists" you are automatically marking women as different or lesser. It's like complimenting a dog that's learned to wear clothes and walk on its hind legs. Sure, it's doing a great job and it looks adorable, but it's still not quite passing as a human and an actual person could undoubtedly do better. Except these American Female Novelists aren't "not quite passing." They're not passing at all because, as some of the best and most important authors in American history, writing actually comes quite naturally to them.